Forever Young Charter Company is not your normal charter operator, nor do we strive to be. What we offer is a more private and laid back island experience that puts you in the captains seat of your own trip. 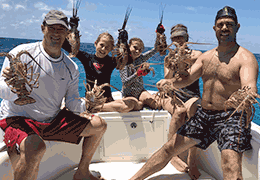 From spearfishing to sunsets, we give families and small groups an experience you won’t find anywhere else. Our team is a small group of family and friends, who work together with integrity to share our passion for the work we do. Our mission is to enhance the way you dive, spearfish, and experience the Florida Keys. With a vision to build your appreciation and respect for the places our charters bring you. From spearfishing to sunsets, let us show you what the Florida Keys has to offer. If you would like to book a charter or have any questions, please do not hesitate to contact us.